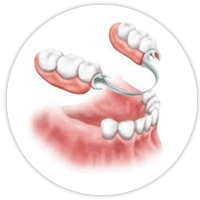 With today’s dental advancements we can fill the embarrassing spaces between your teeth with custom made partial dentures. Visit our Calgary Denture Clinic today and let us help you get your smile back. Titanium forms the denture’s metal base. Titanium is thinner and lighter than standard bases. This biocompatible option is comfortable to wear and offers a superior fit. 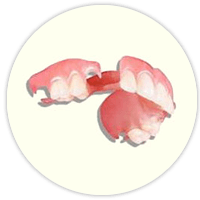 Valplast is a comfortable denture base resin that works well when combined with cast metal framework. This biocompatible nylon thermoplastic matches the base shade of your natural tissue. The valplast allows your tissue color to appear through the material. With this lightweight, comfortable option, you can forget about less attractive metal hooks when you flash your new beautiful smile. 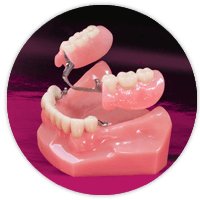 If you don’t like the look or feel of metal clasps gripping your teeth, you can choose partial dentures with plastic, tooth-coloured clasps. They offer a more natural look and are less aggressive on teeth as well. Clasps are eliminated altogether with our precision attachment option. Your dentist will make you a crown with a female part attached to it (or, if you prefer, the female part can be placed on your natural tooth root). 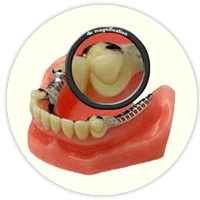 Then, we create a partial denture with a male component in the corresponding position so you can snap dentures into place.